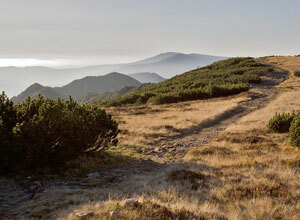 The Giant Mountains are the highest and the most famous mountains in the Czech Republic. They spread in the northeast Bohemia on the border between the Czech Republic and Poland. The Czech part is larger and more fragmented. There are a lot of well-marked tourist trails. For its exceptional natural richness, the area was declared the national park. The Giant Mountains National Park was established in 1963. There is the highest mountain Snezka. 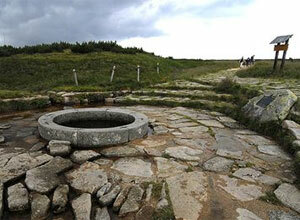 The peak is situated at an altitude of 1602 meters. Beautiful scenery and high quality of tourist services annually attract thousands of visitors. There are perfect conditions for downhill skiing and cross country skiing in winter season. From spring to autumn The Giant Mountains are popular for tourists and mountain bikers. There is the first dam on the river Elbe in Spindleruv Mlyn, which can neither be overlooked nor missed. It lies at an altitude of 694.16 m. Floods, which caused catastrophic damage at the end of the 19th century, were the impulse to build this beautiful work. Construction was begun in 1910 by the firm Redlich & Berger. The whole construction was completed in 1916 and approved on the 18th October in 1918. Surroundings around the dam is the place for an easy trip with a stroller or small children. Thanks to the climate and clear mountain springs the dam offers the possibility of swimming. At the dam you can also enjoy some adrenaline. For the more adventurous people there is, for example zorbing. Fishing is permitted, as well. Snezka, the highest mountain in the Giant Mountains, but also in the Czech Republic is situated at an altitude of 1602 meters. The name Snezka comes from the 19th century and it is derived from the name of Snow – like “snow-covered”. The first Czech name was the Hump Snow, then “Sněžovka”. In 1823 the peak was finally called Snezka. The peak of the mountain is rocky and has an area of around 120,000 m². The Czech-Polish border passes over the top of Snezka. 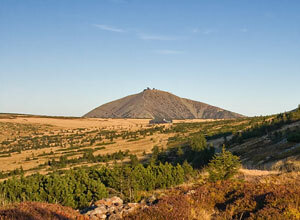 The peak of Snezka serves as a frequent tourist destination of the visitors of the Giant Mountains. To achieve the peak, it is possible to use several hiking trails, but also the cable car, which takes you from village Pec pod Snezkou. The large river Elbe rises 8 km from the center of Spindleruv Mlyn in the peat bogs of the Elbe Meadow at an altitude of 1,386.3 meters. The stone wall near the spring contains 26 colorful signs of the towns through which the Elbe flows. 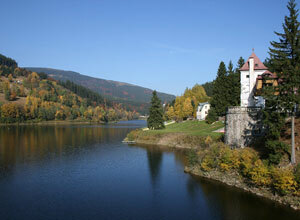 Spindleruv Mlyn is the first town in which the large river of Bohemia flows. The spring of the river Elbe is a popular tourist destination, especially during summer seasons. There you can also watch the unique Pancavsky waterfall (148 m high), which is the highest waterfall in the Czech Republic. The old “Czech path” connecting Bohemia with Silesia was situated near the spring in the past, too. It was one of the oldest business routes. In 1684 it was used by the bishop John Christopher of Tallenberg, who consecrated the river Elbe on the 19th September. According to the historical records the bishop who went to consecrate the river and his camel carrying his things necessary for the ceremony fell exhausted in the middle of the mountain because of the steep climb through the forest and unfavorable weather. Nowadays, the tourists usually reach the peak in peace and without any health problems. According to the parish register, during the consecration of the spring, when the bishop put the crucifix below the water surface, suddenly, the storm fell silent and the sun began to shine over the mountains. A sunny day was coming. There was no doubt that the spring of the river Elbe belongs to Czech rulers.